Update May 31st: A total of 122 civil society organisations from around the world have signed the letter which was delivered to the Danish Minister of Justice and the Danish Minister of Health in mid-May. Thank you to everyone who signed! Following on from last month's suspension of Denmark's HIV-specific criminal law, advocates are now working hard to persuade the Government's working group not to simply rework the law, but to abolish it altogether by avoiding singling out HIV. They are asking the Government to consider only making intentional transmission of a serious communicable disease a criminal offence, as recommended by UNAIDS, and to focus instead on supporting people with HIV (diagnosed and, even more importantly for public health, undiagnosed) to access comprehensive prevention, counselling, testing, treatment, care and support services. What happens in Denmark could have a profound effect on policy, not only in neighbouring Nordic countries – where law reform and other HIV criminalisation policy discussions are also taking place this year – but all around the world. To parapahrase South Africa's Justice Edwin Cameron, who argued in his excellent 2009 article for Norwegian newspaper, Dagbladet, "that by applying its own discriminatory legislation, Norway in effect exports stigma," by abolishing its own HIV-specific law, Denmark in effect would lead the world by exporting rational, public health-based policy. Full text of the introductory remarks and sign-on letter from AIDS-Fondet (Danish AIDS Foundation) is below. Please sign before 29th April 2011 by emailing laura@aidsfondet.dk (and include the NAME OF YOUR ORGANISATION and COUNTRY) and distribute to your networks locally, nationally and globally. We would like to share with you the good news that last month the Danish Justice Minister suspended Article 252 of the Danish Penal Code used to prosecute people living with HIV for 'wanton or reckless' exposure or transmission of HIV. This is the only criminal statute in Western Europe that singles out HIV as "a fatal and incurable disease." The law is undergoing revision and a working group is currently considering whether to amend, or totally rewrite, Article 252. To help this process along, the Danish AIDS Foundation is seeking your endorsement of a letter (see below in bold and/or download here) to the Danish Minister of Justice and the Danish Minister of Health who are leading the working group comprising representatives from the Ministry of Interior, Ministry of Health, the National Board of Health and the Prosecutor General. to ensure that during the revision process the Danish Government takes into due consideration whether the particular section singling out HIV should exist in the Penal Code at all. It is our hope that a successful revision of the Danish Penal Code will allow for other countries to follow suit. 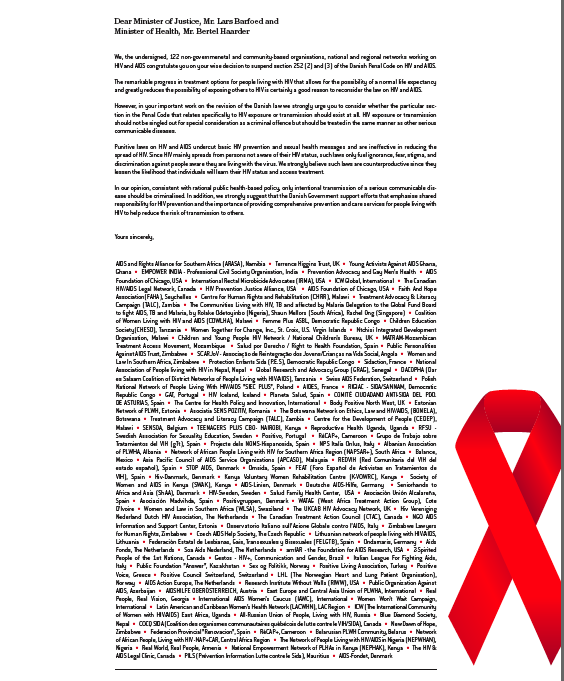 If your organization wishes to endorse the letter below, please send an email to laura@aidsfondet.dk and include the NAME OF YOUR ORGANISATION and COUNTRY before 29th April 2011. We, the undersigned, non-governmental and community-based organisations, national and regional networks working on HIV and AIDS congratulate you on your wise decision to suspend section 252 (2) and (3) of the Danish Penal Code on HIV and AIDS. The remarkable progress in treatment options for people living with HIV that allows for the possibility of a normal life expectancy, and greatly reduces the possibility of exposing others to HIV is certainly a good reason to reconsider the law on HIV and AIDS. However, in your important work on the revision of the Danish law, we strongly urge you to consider whether the particular section in the Penal Code that relates specifically to HIV exposure or transmission should exist at all. 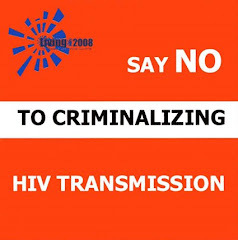 HIV exposure or transmission should not be singled out for special consideration as a criminal offence but should be treated in the same manner as other serious communicable diseases. Punitive laws on HIV and AIDS undercut basic HIV prevention and sexual health messages and are ineffective in reducing the spread of HIV. Since HIV mainly spreads from persons not aware of their HIV status, such laws only fuel ignorance, fear, stigma and discrimination against people aware they are living with the virus. We strongly believe such laws are counterproductive since they lessen the likelihood that individuals will learn their HIV status and access treatment. In our opinion, consistent with rational, public health-based policy, only intentional transmission of a serious communicable disease should be criminalised. In addition, we strongly suggest that the Danish Government support efforts that emphasise shared responsibility for HIV prevention and the importance of providing comprehensive prevention and care services for people living with HIV to help reduce the risk of transmission to others.